Ah nature—we do it well, don’t we? Beaches, mountains, bush—the Sunshine Coast’s natural beauty is probably the one thing we’re most renowned for, outside of the epic breakfasts we dish up and the friendly locals that actually say “hello” to peeps they don’t even know. But, back to Mother Nature. Along with early mornings, she looks her best during the magic hour—that wedge of time when the sun dips and the sky melts into pinks and purples. It’s a slice of time we’re happy to repeat. Day after day after day. 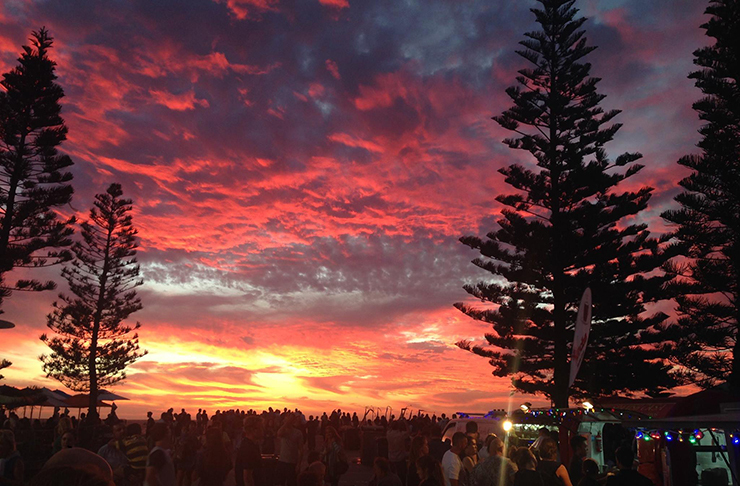 Especially, if we get to witness it at one the best spots to watch the sunset on the Sunshine Coast. Nature-lovers, this one’s for you! Two words: floating bar. 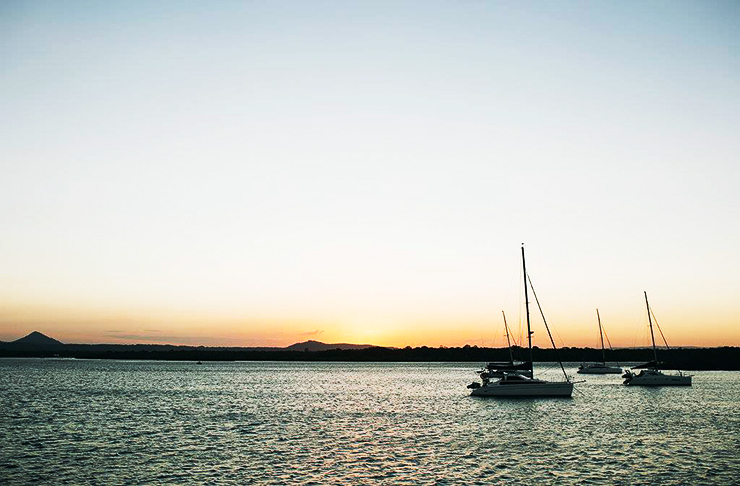 Coasting the Noosa River every Sunday in the golden hours, Catalina is the Queen of classy sunset cruises. Wile away the last afternoon light on the water with signature cocktails, craft beer, and live music. Nab a sunlounge on the upper deck and you’ll score yourself a prime position to watch the sunset over Noosa Hinterland. If you’re a regular of the Sunny Coast to Brisbane jaunt, then you know Wild Horse. Other than rocking the best mountain name ever, this lookout gets a 10 out of 10 rating on our list of the best spots to watch the sunset on the Sunshine Coast. As much as we love massive hikes, we’re fans of small ones too, and when they lead to sweeping 360 degree views, we’re pretty much smitten. Time your stroll to the summit right and you’ll see the Glass House Mountains turn to silhouettes as the sun fizzles out behind them. The ultimate way to spend a lazy weekend afternoon, with the added bonus of witnessing a free natural lightshow, Bulcock Beach offers one of the best spots to watch the sunset on the Sunshine Coast. Grab some snags, fill the Esky, and cook up a barbecue with your mates. It’s free and totally worth doing on those weeks when you’ve spent your dosh but don’t want to play the “I’m broke” card. Yeah, yeah, you know all about this giant rock poking out of the land. Hell, you probably ran up it like fives times this week already. #yeahright. But have you conquered Mount Coolum for the sole purpose of capturing some wicked sunset vistas? No? Well then, what are you waiting for? Pack some nibbles and a couple of beers, and watch that big orange ball go down. It’ll be something spesh. Scout’s honour! Fact: sunsets are wayyyy better when accompanied by sundowners. And for a prime waterfront posi complete with fiery skies and a swanky bottle of wine, The Boat Shed is hard to beat. With the river at your feet, you can talk about the serenity and ponder whether life can get any better than this. Probs not. We love a good multi-tasking arvo, especially if it means making the weekend last a little longer. If getting out of the water to watch the sunset sounds like the worst idea ever, then head to the points where you can swim, surf, and still be graced with spectacular sunset views. If you have a change of heart last minute, skedaddle to Laguna Lookout to see Noosa bathed in a golden glow. Anywhere along Mountain View Road in Maleny will do the trick if you’re on the hunt for one of the best spots to watch the sunset on the Sunshine Coast, complete with an incredible view over the Glass House Mountains. But, if, like us, you like your orangey skies with a frosty brew (or two), then race the clock to King Ludwigs German Restaurant or the no-frills-but-has-epic-views Tranquil Park Mountain Resort. Best bet is a Friday or Saturday arvo, as these guys close early during the week. Take note! Ticked off where you can catch the best sunsets? We’ve got more where that came from. Check out these hidden lookouts we probably shouldn’t tell you about. Love a sunrise? We're got the very best right here!